I have been fascinated by this place ever since I first saw this picture in Whipple’s Report. 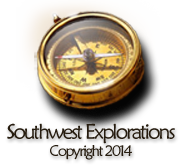 The expedition’s camp 70 was just east of the modern Zuni community of Black Rock and this spring was nearby. The campsite would have been within the flooded area behind the modern Black Rock Dam – but where was the spring? Silt deposits behind the dam have dramatically altered what the terrain was like in 1853. There are not many canyon walls in the “reservoir” area today- just a flat plain. I have collected copies of old maps of the Zuni Reservation and visited the reservation but have been unable to determine its exact location. Zuni archaeologist T. J. Ferguson once told me that is was buried under the Black Rock Dam itself in 1910. I have not been able to verify that with other data. The spring was one of the most important sites in the Zuni religion* so it’s hard for me to believe they allowed it to be buried. The canyon walls in the background of the picture suggest the possibility that the spring may have been located within the small canyon below the dam. If so, it may still be there. When I went to look for it I was not able to get permission to enter that area. “… An example of the homage paid by the red race to genii of fountains is furnished in the sacred spring of the Zunis, represented on plate 37. This basin of fine water is located near the table-land on a branch of the river Zuni, between the ruins of Ojo Pescado and the present pueblo of Zuni. It is between seven and eight feet in diameter and around it a low circular wall, from fifteen to twenty feet across, has been raised. The spring is cleared out every year, when an offering is made to the spirit of the font, of one or more water-pots, which are placed on the wall. A dozen or more whole ones were observed, while fragments abounded. Some of the remaining vases reputed to have been offered centuries ago by the pueblo caciques”. 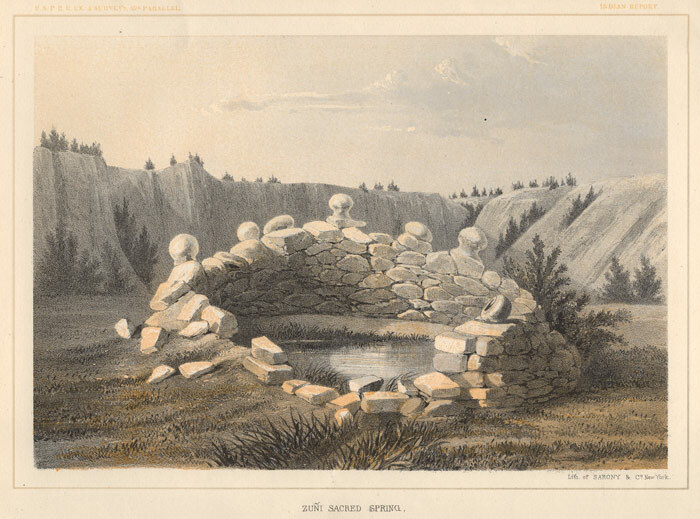 * Zuni mythology states that the first [Zuni] people emerged from the underworld through this opening. The spring was said to be periodically cleaned out and jars (presumably for some ceremonial use) were arranged around the top of its protective wall. When Whipple asked to have some of these jars for his artifact collection the Indians forbid him to even change the order of their positions on the wall. In one of Whipple’s illustrations of antiquities appears a drawing of a jar described as “abstracted from the sacred spring of the Zuñis” (Railroad Survey, Volume 3, Part 3, p. 45). It appears that he took one while they weren’t looking. -ed.